Education Minister, Jerusalem Affairs Minister to work on revised bill to be resubmitted next week. 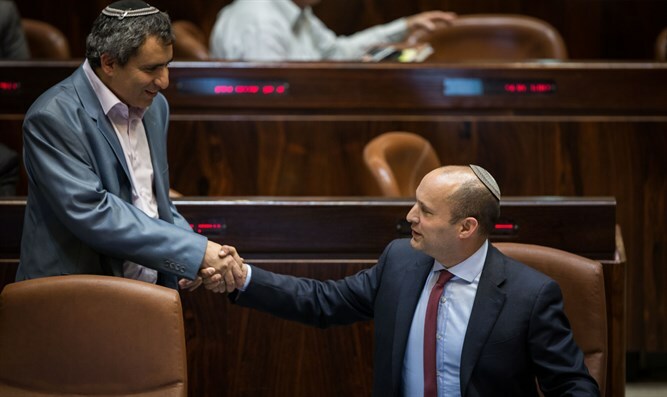 Education Minister Naftali Bennett and Jerusalem Affairs Minister Ze'ev Elkin agreed Sunday to work together this week to reach an agreed-upon version of the United Jerusalem Law and to bring it up for approval in the Ministerial Committee for Legislation next week. The bill,which was initiated by the Jewish Home Party, sought to require that any vote to divide Israel's capital of Jerusalem be approved with a supermajority of no less than 80 MKs out of the 120 in the Knesset. Prime Minister Binyamin Netanyahu used his veto power Sunday to prevent a vote on the bill from taking place. An argument arose between Minister Elkin and Justice Minister Ayelet Shaked during the discussion this morning at the Ministerial Committee on Legislation. Elkin demanded that the bill be promoted with the consent of the Jerusalem Affairs Ministry, which he heads, while Shaked insisted that the bill be passed without conditions or reservations. In the end, under the guidance of Prime Minister Netanyahu, coalition chairman David Bitan withdrew the bill from consideration. “It is unfortunate to us that narrow political considerations take precedence over the prevention of the division of Jerusalem. We will continue to fight for the passage of this law, and will make every effort to advance the law's passage over the next few days," the party added.